A Crystal heart nose Pin that's perfect for everyday wear. Please check the size before purchasing. We no longer accept return/exchange of nose pins due to hygienic reasons. A floral nose pin that's perfect for everyday wear. Please check the size before purchasing. We no longer accept return/exchange of nose pins due to hygienic reasons. A pearl heart nose Pin that's perfect for everyday wear. Please check the size before purchasing. We no longer accept return/exchange of nose pins due to hygienic reasons. A tourmaline heart Nose Pin that's perfect for everyday wear. Please check the size before purchasing. We no longer accept return/exchange of nose pins due to hygienic reasons. A beautiful crystal stone nose pin that can be worn everyday Please check the size before purchasing. We no longer accept return/exchange of nose pins due to hygienic reasons. A striking iolite stone in the center of this lovely nose pin gives it a royal look. Please check the size before purchasing. We no longer accept return/exchange of nose pins due to hygienic reasons. A striking crystal stone in the center of this lovely nose pin gives it a royal look. Please check the size before purchasing. We no longer accept return/exchange of nose pins due to hygienic reasons. A striking tourmaline stone in the center of this lovely nose pin gives it a royal look. Please check the size before purchasing. We no longer accept return/exchange of nose pins due to hygienic reasons. A striking green onyx stone in the center of this lovely nose pin gives it a royal look. Please check the size before purchasing. We no longer accept return/exchange of nose pins due to hygienic reasons. A beautiful red stone nose pin that can be worn everyday Please check the size before purchasing. We no longer accept return/exchange of nose pins due to hygienic reasons. A beautiful green stone nose pin that can be worn everyday Please check the size before purchasing. We no longer accept return/exchange of nose pins due to hygienic reasons. A beautiful pink stone nose pin that can be worn everyday Please check the size before purchasing. We no longer accept return/exchange of nose pins due to hygienic reasons. A star nose pin in an oxidised finish that can be worn casually. Please check the size before purchasing. We no longer accept return/exchange of nose pins due to hygienic reasons. A silver border with a onyx in the center gives this nose pin a touch of elegance. Please check the size before purchasing. We no longer accept return/exchange of nose pins due to hygienic reasons. A silver border with a carnelian in the center gives this nose pin a touch of elegance. Please check the size before purchasing. We no longer accept return/exchange of nose pins due to hygienic reasons. A silver border with a onyx in the center gives this nose pin a touch of elegance Please check the size before purchasing. We no longer accept return/exchange of nose pins due to hygienic reasons. A silver border with a pearl in the center gives this nose pin a touch of elegance. Please check the size before purchasing. We no longer accept return/exchange of nose pins due to hygienic reasons. A silver border with a coral in the center gives this nose pin a touch of elegance. Please check the size before purchasing. We no longer accept return/exchange of nose pins due to hygienic reasons. A simple turquoise chakra nose pin with beads all around. Perfect for everyday use. Please check the size before purchasing. We no longer accept return/exchange of nose pins due to hygienic reasons. A simple carnelian chakra nose pin with beads all around. Perfect for everyday use. Please check the size before purchasing. We no longer accept return/exchange of nose pins due to hygienic reasons. A simple coral chakra nose pin with beads all around. Perfect for everyday use. Please check the size before purchasing. We no longer accept return/exchange of nose pins due to hygienic reasons. 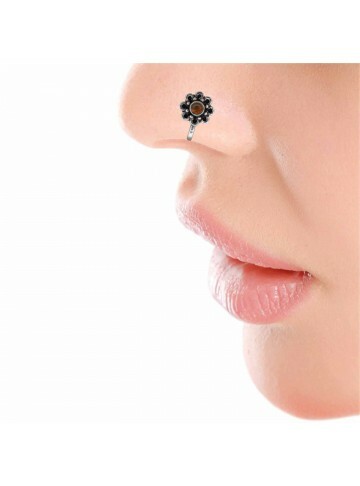 A simple black onyx chakra nose pin with beads all around. Perfect for everyday use. Please check the size before purchasing. We no longer accept return/exchange of nose pins due to hygienic reasons. A simple green onyx chakra nose pin with beads all around. Perfect for everyday use. Please check the size before purchasing. We no longer accept return/exchange of nose pins due to hygienic reasons. A simple chakra nose pin with beads all around. Perfect for everyday use. Please check the size before purchasing. We no longer accept return/exchange of nose pins due to hygienic reasons. A simple chakra nose pin with beads all around. Perfect for everyday use Please check the size before purchasing. We no longer accept return/exchange of nose pins due to hygienic reasons. A star nose pin in an oxidised finish that can be worn casually Please check the size before purchasing. We no longer accept return/exchange of nose pins due to hygienic reasons. A simple disc nose pin with beads all around. Perfect for everyday use. Please check the size before purchasing. We no longer accept return/exchange of nose pins due to hygienic reasons. A floral nose pin that's perfect for everyday wear Please check the size before purchasing. We no longer accept return/exchange of nose pins due to hygienic reasons.